Smoked half chickens can’t get easier than this recipe. With a Spicy Peach Glaze brushed on at the end, these smoked half chickens have a great sweet, spicy, smoky flavor that is hard to beat. To start you’ll need a whole chicken in the 6lb range. Remove the chicken from the packaging and check the cavity for liver/gizzards. Save these for later use if you want. Next I want to split the chicken into 2 halves. Place it breast side down on a cutting board and use a knife to make a cut on each side of the backbone. I find it easiest to come in with kitchen shears at this point and cut right through the bones. Remove the backbone (save that for stock) and continue to cut right down the middle of the breastbone going all the way through the skin. This will separate the chicken into 2 pieces. Season each side of the halves with Killer Hogs The AP Rub followed by a light coat of Killer Hogs The BBQ Rub on both sides (you can use your favorite seasoning here). Now fire up the grill and bring the cooking temperature to 275⁰. I’m using a Green Egg today but any grill/smoker set up for indirect cooking will do the job. Throw a couple chunks of pecan wood on the hot coals and place the chicken on the cooking rack. Touch up the skin as needed with additional dry rub. Let the Half Chicken smoke for 1 hour then insert a probe thermometer into the thickest part of the breast. Set the alarm for 160⁰ and continue to cook. If the skin looks dry you can spray it with a little vegetable cooking spray to prevent it from shrinking or turning dark. Combine the glaze ingredients in a small pan over medium heat. It’ll take about 5 minutes to come together just be sure to stir it occasionally. When the breast hits 160⁰, brush the warm glaze over each half and set the thermometer for 165⁰. 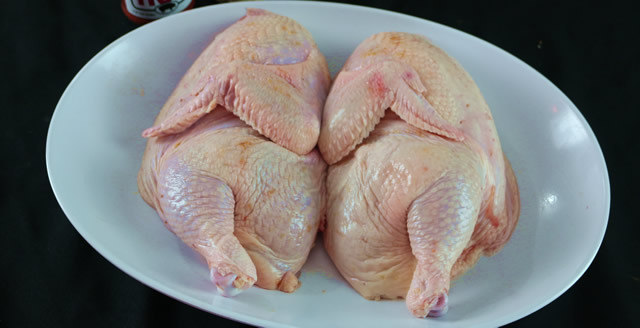 These chicken halves are done when the internal temp reaches 165⁰ in the breast and 175⁰ in the thigh. Be sure to give them a short rest before serving.